"Sodium persulfate" which is used in electronics is well suited. Safety goggles! Exhaust hood or outdoors, leakage of sulfur oxides! One mixes and comminutes in a crucible a spatula tipful of titanium oxide together with at least 4-5 times more of sodium peroxidisulfate. 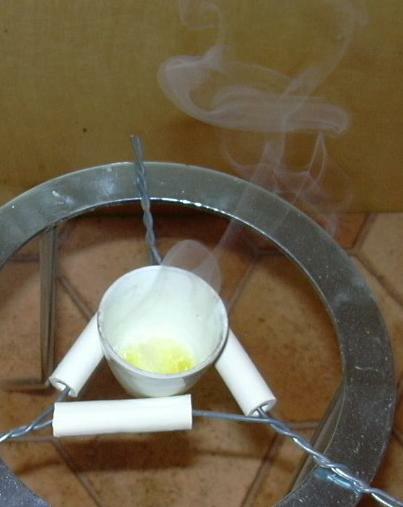 One heats the crucible which has been placed on the clay triangle with a burner until a mostly clear melt is produced and, should the melt solidify, heats this over and over again, in total for at least 5 minutes. The melt's color becomes yellowish due to the sulphur oxide and especially under excessive heat ample sulphur trioxide fumes are released! After the mixture has cooled off, one adds approximately 1 ml of concentrated sulphuric acid, as well as 10 ml of water. One comminutes and stirs until the residue is largely dissolved or suspended. If desired, one can filter the suspension, the unreacted titanium oxide does not interfere as a rule. One fills the liquid in a properly marked bottle and keeps this for further use. No harmful residue is produced. Soluble titanyl sulfate is formed. If one wants to demonstrate titanium(IV)in a solid substance, one can appropriately convert this. derived from 4.3.3.12 "Titan", S. 451, - there potassium hydrogen sulfate is used instead of sodium peroxodisulfate.